“They’ve got their definitions and they won’t fiddle round trying to rethink them ‘cos there’s no middle ground. Short change me and they short change the show, I almost tell myself ‘George, change the flow’. But they should have know better. Never send a boy to do a man’s job, that’s a waste of a go-getter. A bit of a different feel with the clip this time. One night a couple of years back, I was flicking through E-Music, looking for something to buy and I came across the album “There Were Seven” by The Herbaliser and heard this track. I like Rap. Yes, I’m 50 years old in 8 weeks and I like Rap. I have ever since I heard the stone cold classic “Adventures of Grandmaster Flash on the Wheels of Steel”. But, despite the rise of UK Rap over the last 10 years or more, nothing moved me. Until this track. Literate, great flow and rhythm. It has everything I want. The older I get, the wider the poles, from thoughtful lyrics, message and literacy to squalling feedback and white noise. I can’t explain, I don’t have the words. I guess you like what you like. 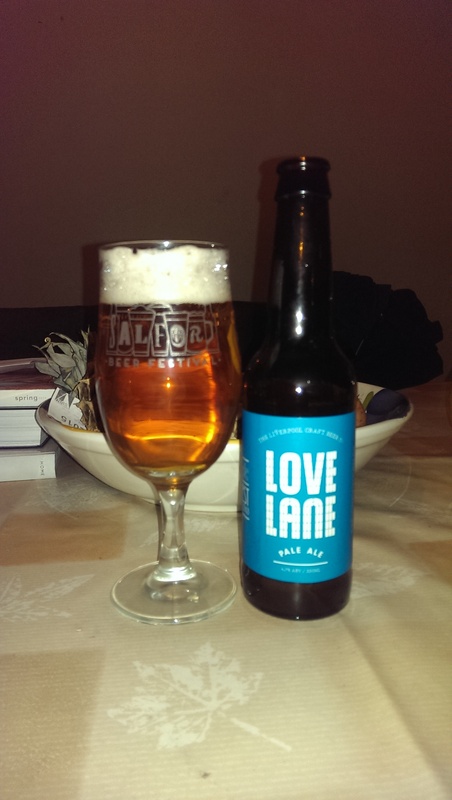 Which brings me to beer…..
A pale golden beer with a light white head and the unmistakable perfumed aroma of thyme, savoury and floral.Oh WOW!!! This is a full on herbal hit! Light and refreshing with a barely discernable biscuity sweetness, this is just SO refreshing and light for a beer at this mid strength. This is just such an unusual and lovely flavour. The other thing about it is that with a really low bitterness, this is such an easy drinking beer. Herbal thyme up front but with a nice gentle hoppy dry finish. 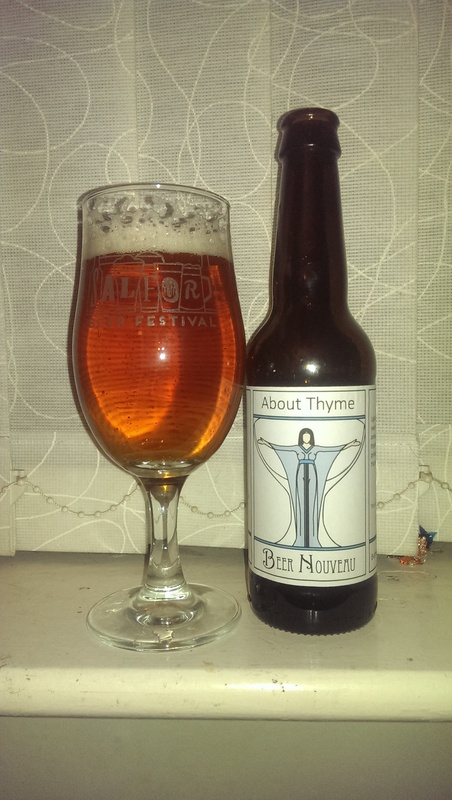 To some people, thyme may not be up their Street, but I love this beer. My favourite that Steve has made so far. Would be perfect with some roast chicken! 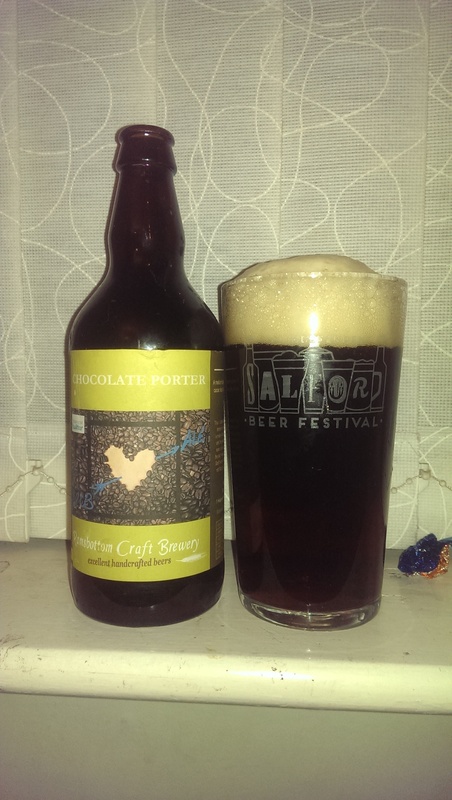 A deep ruby brown beer with lovely carbonation, producing an abundant off white head giving off a light sweet cocoa aroma.Quite full-bodied for such a mid strength beer with that cocoa / chocolate firmly in the vanguard, flavour wise. Some vine fruit too as well as a background coffee note that intensified following the swallow. The initial sweetness from the chocolate recedes allowing a hoppy bitterness to come through and add to that coffee to give a pronounced dry finish. A really rather lovely Porter this! Obtained via a swap with my good buddy Otto (hope the glass got home safe!) this is a deep golden, almost Amber, beer with a lasting white head pumping out an aroma laden with sweet citrus, think orange, mandarin and a hint of Mango.Woof!!!! This is GORGEOUS! 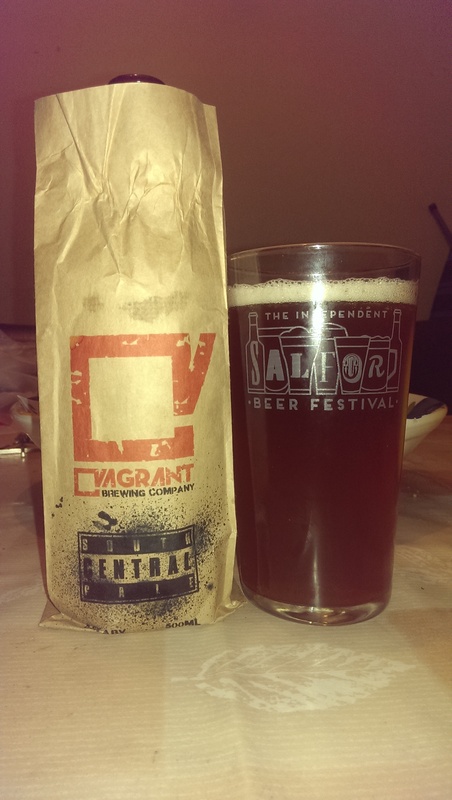 YOu get an instant hit of chewy caramel biscuit malt which is swiftly mugged by resinous hops. A shedload of marmalade fruit then followed by a big old resinous hit that seems to mutate into licorice root. It is a belting beer this. The whole caboodle is rounded off by a dry resinous sticky finish. If only you could get their beer over this hill on cask. Hmmm…#ISBF2015 anyone? Beautiful can design. Really classy. 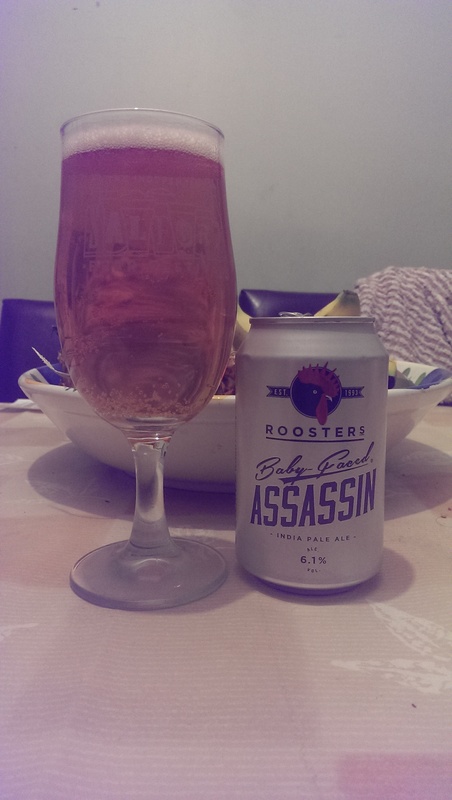 Pale golden beer with a thin white head booming out an aroma containing Mango & grapefruit. Really fruity.Oh my is this a proper big IPA! 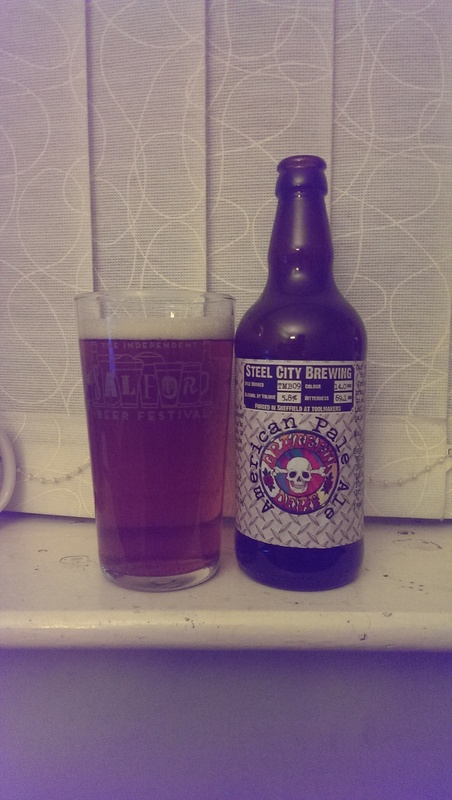 Slightly sweet and chewy digestive biscuit malty base with a whole Barrow load of fruit hanging on. Mango is uppermost, sweet and tropical then tangerine and finally a hint of bitter grapefruit, maybe even a touch of pineapple. Impressively low on bitterness making this a smooth mouthful and exceptionally easy drinking. It carries its weight dangerously well. This fruitiness eventually recedes and relents enough to give way to a fruity and quite sticky resinous finish. All in all a cracker. You see what I did there? Getting the disclaimer in right at the start. I always say when I’m given something to try that I’ll only review it if (and ONLY if) I actually enjoy it……The packaging works for me. Makes me think of US liquor restrictions with that brown paper bag look. A nice hand crafted feel and touch. A good visual start. Then the beer. A hazy righteous Manc Murky light brown /dark golden beer with a proper white fluffy head and an aroma that just reeked of the fruit basket! Peach, oranges, mango. Yum. All fruit present and correct in the mouth too. As juicy as a packet of Starburst and no mistake! Firstly the mango and peach, then a pleasant bitterness strays across the tongue a little yeastiness to mine which (intentional or otherwise) added a slight Belgian touch. No bad thing in my book. I was at Black Jack when the boys were brewing their first batch of this on the Six O’clock Brewing kit and was yet to taste it until now. Remedied. And how. Just as a pale ale should be. Pale golden and absolutely bursting with citrus through that white head. Oh my!Peach, Mango, even more than a hint of sharp lime. This aroma promises SO much!…. And MY does it deliver on those promises! Fruity. So fruity. More Mango than peach, but that lime is certainly present and correct. This is absolutely lovely and so packed with fruity goodness that there simply HAS to be at least two of your five a day in here! Nice snappy dry and resinous finish to this accomplished Pale Ale. A beaut. Well. That’s it until the next batch of beery waffling and wittering. Drink Local people!